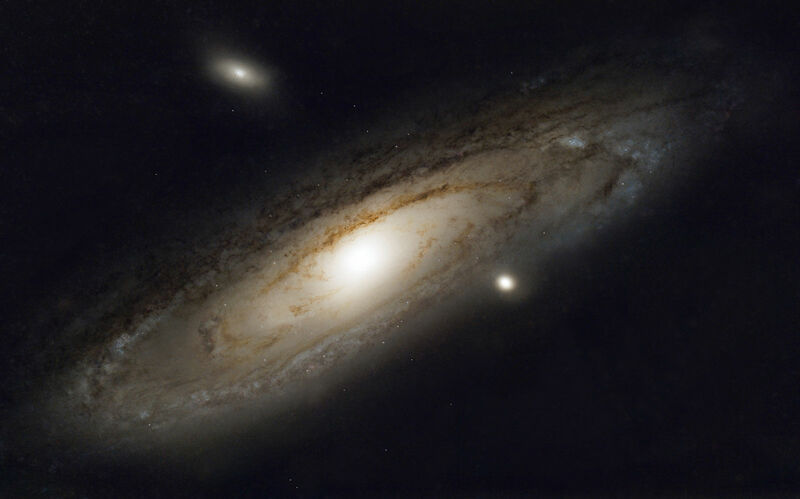 What would the Andromeda Galaxy (M31) look like from outside our own galaxy? Perhaps like this! I removed the stars from an image of M31 I shot in mid-October (those stars lie within our own galaxy), and added back to the image the 50 or so globular clusters associated with the Andromeda Galaxy that I had also captured in the image and later identified. The globular clusters have a star-like appearance in this image. I also added back in the blue giant stars visible in Andromeda's star forming regions. I hope you find this image as interesting as I do! M31 is a large spiral galaxy, much like our own, that lies some 2.5 million light years from us. It is one of the farthest objects we can see with our naked eyes - clearly visible in the constellation Andromeda on a dark, moonless night. Two of its satellite galaxies are also visible in this image: M110 (the bright elliptical galaxy at 11 o'clock relative to M31's center), and M32 (the much smaller elliptical at about 4 o'clock). Many bright, blue star forming regions are visible in this image, as are some reddish nebula (clouds of gas and dust) that lay within it. The complex dust lanes that mark Andromeda's spiral arms and obscure the light of the stars in those areas are particularly striking. Your M31 is incredibly detailed, well done!